Lt. Alfred C. Israel "Izzy," USN, Ret., was born March 12, 1911, in Des Moines, IA, and passed away May 6, 2007, in Aiken, SC. George Funeral Home & Cremation Center, Aiken, SC, is assisting the family. "Izzy" joined the Navy in 1929 and went aboard the USS Saratoga CV3 to begin his Naval career. His ship was torpedoed twice while serving his country during WWII. During the Korean War he served on the USS Skagit (AKA 105) and as a reconnaissance officer ashore. He took part in the rescue mission in Vietnam, (Operation Passage to Freedom) taking refugees on Navy ships to safety before the U.S. entered the conflict. "Izzy" loved everything about the Navy life that took him and his family around the world from California to Massachusetts to Pennsylvania to Japan and Hawaii. 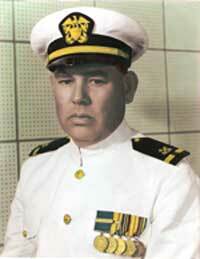 His last duty station was in Honolulu, HI, where he retired in 1960. He and his wife Marie, who died in 1998, moved to San Diego, where they enjoyed playing golf, gardening, and traveling. His love of country, the U.S. Navy and his family reminds those who knew him of the quotation, "I could not love thee so much, did I not love Honor more." "Izzy" leaves behind his only child, Nadine Thomas, wife of Sam Thomas, of Aiken, SC and a grandson Michael Trevors, of Poulsbo, WA, and four great-grandchildren. He will be buried at the Tahoma National Cemetery in Seattle, Washington. Visit George Funeral Homes.com to sign the online condolence. Navy Honors Service for Alfred C. Israel is scheduled at The Tahoma National Cemetery on Friday June 22, 2007 at 2:15pm.